The other day, during a wander in the downtown area, we spontaneously ducked into a beautiful old church on a quiet back lane. I forget the name, but it is a Presbyterian church. The outside is fairly innocuous, belying the beauty inside. The pews are perfectly maintained dark wood, there are still plaques on the walls discussing the founders of the church (colonists, of course) and exquisite stained windows. There is also an organ that spans nearly two stories high and a marble pulpit for those who take to preach to the flock. We walked around for a bit, taking in this quiet oasis, as a lone woman took down Christmas decorations. Amid the bustle and frenzied consumerism of the downtown area, this is an amazing retreat, regardless of your religious (or lack of beliefs). There are some amazing churches downtown. The synagogue is beautiful too, and unique (although rebuilt after the earthquake). 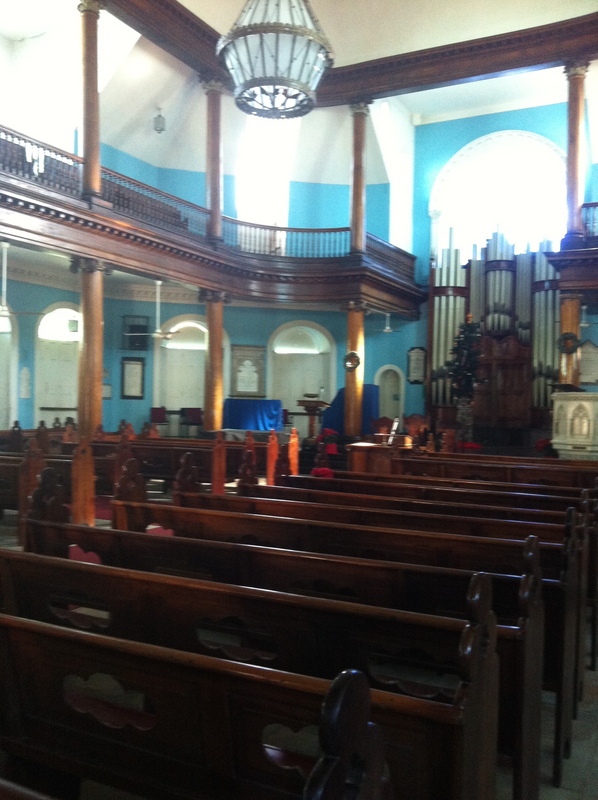 This interior reminds me of St Jago Cathedral in Spanish Town and the little church in Port Royal too. All that lovely mahogany!